The club runs a number of Coaching Days on the Thursdays before Track Days. These days are limited to 25 riders. All coaches have MA coaching accreditation and many years of experience. Coaching days NEED to be pre-booked, we do not accept on the day entries. On a coaching day there is 25 riders with a dedicated coach who manages a group of students with structured coaching, including step by step approach to corner entry, mid corner and corner exit. We also work on vision, braking and anything else we can see would improve your riding. Each group has on track and off track coaching, we have a dedicated section of track that we use to give instant feedback to the students, this way they are prompted constantly then they put into practice through the rest of the day’s on track coaching sessions. There are normally three groups which sometimes includes a group of junior riders so each rider feels comfortable with other students of similar experience. There is plenty of riding through the day so ideal to transport your bike to and from if possible and bring some extra fuel. The cost of the coaching day for participants is $300 which includes Subway lunch, drinks & coffee, it is the perfect way to lead into track days which take place on the following day. One day licenses are $30. Please contact the club through the manager@motorcyclesportsmen.com.au with any other questions, hope to see you at a coaching day soon, or fill in an entry form from our Calendar page to book your spot today. Firstly come and meet the coaches who will advise you where to set up. If you do not have a valid Motorcycling Australia License you need a Motorcycling Australia Recreation License, this is filled in when you sign on at start of the day. Tea, Coffee, Drinks and snacks are available all day for participants. Carports are FREE for the day and they include the use of power. PLEASE MAKE SURE YOU USE THE BLACK POWER POINTS ONLY. You will need to bring your own power lead to access the power. Pitting on the bitumen apron surrounding the carport bays is strictly prohibited. Generators are not be used in the car port area. There is no scrutineering on coaching days, but we ask that all machines be either ROADWORTHY (if street bikes) or RACE READY (if race bikes). You are responsible for your own safety! 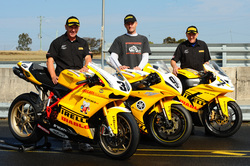 If you are staying for the Friday Track Day then please have your bike prepared as per the Track day information page. There is no fuel at the circuit so top up your tank before or ideally bring some spare fuel so you do not need to ride around with a full tank all the time. -Motorcycle Leathers (1 or 2 piece that can and must be zipped together), motorcycle boots, motorcycle protective gloves and an Australian Standard approved helmet (undamaged). – Leather Jacket, denim or better pants. BACK PROTECTORS ARE HIGHLY RECOMMENDED FOR ALL RIDERS AND MANDATORY FOR THE RACE OR FAST GROUP. ALL PARTICIPANTS ARE REQUIRED TO ATTEND RIDERS BRIEFING. The riders briefing will be conducted to give all participants an outline of the day’s proceedings and instruction on how to enter and exit the track, the meaning of all flags, what to do if you have a break down, run out of fuel or have an accident etc and to answer any questions you may have. If you arrive at the track late, please report to a coach or Practice Supervisor. The Motorcycle Sportsmen provides a number of coaches at every Coaching Day. All of our coaches are MA accredited and have many years of experience in both riding and coaching. They pride themselves on having the ability to share their knowledge and experience to enhance your learning experience. Please come and talk to any of them at any time during the day. They are there to provide assistance to you throughout the day. There will at least one coach in each session during the day and, they will all be wearing a flouro vest. You must obey any instructions given to you by the coaches and/or Officials. Flags are used to communicate important information to the riders on track by the officials. Yellow flag: SLOW DOWN, DO NOT OVERTAKE There is a rider down, or there has been mechanical failure, and this can lead to debris on the track. Green flag: Track is clear, ok to enter the circuit with caution. Red flag: The session has been stopped or is completed and you are required to exit the circuit. Slow down, complete your current lap, and return to the pits. Black flag: If a situation develops that requires a rider return to the pits ASAP, a black flag WILL BE WAVED AT YOU and WE WILL point at the particular rider, this will be done at on the main straight. Please come down to the Pit exit when you return to the pits to find out what the problem is. If you see an accident on the track DO NOT STOP UNDER ANY CIRCUMSTANCES. Qualified coaches control the track and this will ensure your safety on the day. The Coaches can assess, notify, alert and monitor all incidents and conditions to ensure safety and effective running of the day. It is your personal responsibility to ensure you come to the track in good time and not under the influence of alcohol, drugs or any other substance, as this can impact your ability to operate the motorbike and respond with alertness on the circuit. It is your responsibility to offer your fellow riders the respect they are offering you. There are to be NO STUNTS, WHEELIES, STOPPIES, BURNOUTS etc performed by anyone. There is no alcohol or illegal substances permitted at any time during the event. If at any time the Motorcycle Sportsmen believe you to be under the influence and/or acting inappropriately they will ask you to leave the circuit, and your monies will be forfeited. Do not refuel any machines on the bitumen areas in the pits. If you spill fuel or fluid of any description please come up to the tower as we have sorb there to clean up with. Do not try to move from your line to allow for faster riders coming from behind – keep your line, they will get around you. Pay attention to the flag marshals. This is not a race day; this is meant to be a fun, safe and enjoyable day for all. Do not let your behavior ruin it for others. are welcome to come along and have a look and are welcome in the pit area as long as they have the appropriate footwear. There is no food available at the circuit so spectators must supply their own food. All Motorcycle Sportsmen events will take place even if it rains, it will be your decision if you choose not to participate. In very rare cases, if track officials deem the track dangerous due to flooding and/or debris on the circuit, it may be cancelled. If your event is cancelled due to bad weather you will receive a refund of fees paid and you will need to rebook another day if you wish to attend another event. Entries will not be transferred to another event. Cancellation of your entry into any Motorcycle Sportsmen events up to seven(7) days prior to an event will be accepted at the club’s discretion and will result in a refund minus an administration fee of $25. Entries will not be transferred to another event. If you decide to withdraw from a Motorcycle Sportsmen event with less than 7 days’ notice you will need to provide a medical certificate in order to get a full refund. Entries will not be transferred to another event. If you decide to withdraw from a Motorcycle Sportsmen event with less than 7 days’ notice and do not supply a medical certificate you will be charged an administration fee of $50 which will be deducted from your refund. Entries will not be transferred to another event. 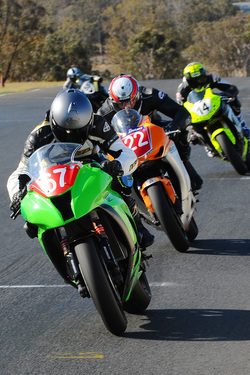 Track Days are normally run on Fridays and are a great way to hone your riding skills. The days are arranged into either three or four groups depending on the event and the entries. All laps are timed and groups are re-organized based on lap times throughout the day to ensure your enjoyment and safety. Track days NEED to be pre-booked, we do not accept on the day entries. If you have never ridden at Morgan Park please nominate for group 4, groups are changed throughout the day according to lap times. Firstly come and sign on, this happens in the room at the bottom level of the tower on the main straight. Please bring your Department of Transport or Motorcycling Australia License with you as you will need them to complete your paperwork. If you do not have a valid Motorcycling Australia License you will need to have paid for a Motorcycling Australia Recreation License on your original application. You will be issued with a coloured armband with your name on it, please wear this at all times during the day. Then make your way to the Scrutineering Area. You need to take your bike and gear to scrutineering to be checked. Please remember to have signed on first. Once you have signed on and your bike and helmet have been checked, you can relax until Riders Briefing. If you have booked and paid for a carport the allocation list will be on the door of the office and on some of the poles in the carports. Please only put your bike and equipment in the carport allocated to you on the day. Carports cost $50 for the day which includes power. PLEASE MAKE SURE YOU USE THE BLACK POWER POINTS ONLY. You will need to bring your own power lead to access the power. Generators, with 60dbA or less noise output may be used if pitting on the grassed/dirt area behind the car ports. Pitting on the bitumen apron surrounding the carport bays is strictly prohibited. The Motorcycle Sportsmen use timing transmitters for all participants in a track day. Transmitters are available after you have signed on and completed your paperwork. You will be required to have a $50 bond before you collect your transmitter. Please bring cash or cheque with you. This bond will be refunded once your transmitter has been returned to the timekeepers after your last track session. All machines must attend Scrutineering. Machines involved in accidents must be re-scrutineered before going back on the circuit. All machines must be either ROADWORTHY (if street bikes) or RACE READY (if race bikes). Remove or wire up centre stands and use side stand only. Remove, tape over or turn in rear view mirrors. Tape or wire passenger pegs in the closed position. Remove luggage racks, gear sacks etc. Machines must have headlights, tail lights, turn signals, mirrors and speedometers taped. Registration plates will need to be removed once you arrive at the track. Fuel: Top up your fuel tank close to the circuit and if you can, bring some spare fuel. GROUP 1 – Leathers (1 or 2 piece that can be zipped together), motorcycle boots, protective gloves and an Australian Standard approved helmet (undamaged) must be presented at scrutineering. BACK PROTECTORS ARE MANDATORY FOR THIS GROUP. GROUP 2 – Leathers (1 or 2 piece that can be zipped together), motorcycle boots, protective gloves and an Australian Standard approved helmet (undamaged) must be presented at scrutineering. BACK PROTECTORS ARE HIGHLY RECOMMENDED FOR THIS GROUP. GROUP 3 – Leather Jacket, denim or better pants, ankle boots, protective gloves and an Australian Standard approved helmet (undamaged). BACK PROTECTORS ARE RECOMMENDED FOR THIS GROUP. If you are unsure of which group to enter for the track day, come prepared for if the Coach feels that you need to move between classes. For example, if you entered Class 2, however the Coach feels that your experience demonstrates that you should be in Class 1, you will require a back protector before we can move you up. The same situation applies with those who have entered Class 3, you will require either 1 or 2 piece leathers and motorcycle boots before you are permitted to progress to a higher group. ALL PARTICIPANTS ARE REQUIRED TO ATTEND RIDERS BRIEFING. Riders not present or in special circumstances not having a representative WILL be excluded from the days event. This may also apply if the mandatory sign-on at Rider’s Briefing is not completed. The riders briefing will be conducted to give all participants an outline of the days proceedings and instruction on how to enter and exit the track, the meaning of all flags, what to do if you have an accident etc and to answer any questions you may have. If you arrive at the track late, please report to the Tower and ask to speak to the Practice Supervisor. This event will run to a strict time schedule. Please do not dawdle on the final lap of the session. You are only causing time delays which may result in less track time. The Motorcycle Sportsmen provides a number of coaches at every Track Day. All of our coaches are MA accredited and have many years of experience in both riding and coaching. They pride themselves on having the ability to share their knowledge and experience to enhance your learning experience. The coaches are pitted on the top row of carports just beside the tower and are available all day. There will at least one coach in each session during the day and a number of Track Marshals, they will all be wearing a flouro vest. You must obey any instructions given to you by the coaches and/or Track Marshals. Red flag: The session has been stopped and you are required to exit the circuit. Slow down as there is potentially a bike down somewhere on the track, complete your current lap, and head to the pits. Chequered flag: Quite simply, this flag signals the end of the current session, return to your pit. ANY RIDERS WHO IGNORES ANY FLAG OR OFFICIAL DIRECTION WILL BE WARNED ONCE ONLY, ANY FURTHER INCIDENTS WILL RESULT IN EXCLUSION FROM THE REST OF THE DAY. If you see an accident on the track DO NOT STOP UNDER ANY CIRCUMSTANCES. Qualified Track Marshals control the track and this will ensure your safety on the day. The Track Marshals can assess, notify, alert and monitor all accidents and conditions to ensure safety and effective running of the day. The Motorcycle Sportsmen will always pick up crashed and broken-down bikes to minimize any risks around the track. Stopping of the session for a brief period of time guarantees everyone's safety, and a fun track day for all. If you do crash your bike, and are capable of it, please remove yourself and/or your machine from the track and move to the tyre walls where you are out of harm’s way. If you want to ride again throughout the day, you must have your bike re-scrutineered before re-entering the circuit. Failure to do so, will result in immediate cancellation of your day. Queensland Ambulance paramedics will be on track all day to deal with any injuries or illnesses. There is no alcohol or illegal substances permitted at any time during the event. If at anytime the Motorcycle Sportsmen believe you to be under the influence and/or acting inappropriately they will ask you to leave the circuit, and your monies will be forfeited. The Track Day Supervisor has the right to black flag any person for any reason, black flagged riders must come in immediately. Only enter the track when instructed to do so by the Pit Marshal. Keep track of the day’s schedule, listen out for PA announcements. This is not a race day, this is meant to be a fun, safe and enjoyable day for all. Do not let your behaviour ruin it for others. The officials on the day are there for your safety, they are all volunteers and as such deserve your respect. They have given of their time to ensure that you enjoy your day. Please thank them if you get the chance. SPECTATORS are welcome to come along and have a look and are welcome in the pit area as long as they have the appropriate footwear and are over the age of 16yrs. Tea and Coffee is available at the Tower. No Food or Drinks are available at the circuit. Please bring food and drinks with you for the day.